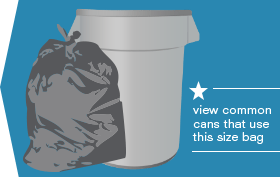 Our 55-60 Gallon Bag collection offers many bags that usually work well in the cans below. Within our selection of 55 gallon trash bags to 60 gallon garbage bags, you’ll find everything from eco-friendly bags made from recycled post-consumer materials to blue recycling garbage bags, and from lightweight waste basket liners to construction garbage bags which could double as landscaping garbage bags. Certain bags are even heavy-duty enough to rival some contractor trash bags. When you’re deciding which bag you need, remember that the thickness of the bag depends on the mil or micron count. The higher that number is, the stronger your bag will be! While you’ll often find 55 to 60 gallon trash bags lining outdoor trash cans, or working hard in restaurants, warehouses, large offices and workshops, this size of bag is also popular for big post-event cleanups. Aside from the usual black and clear garbage bags, we offer them in many colors, so you can even coordinate your garbage bags with your party theme or color palette! When you switch to wholesale garbage bags, you instantly save your home or business both time and money. No more trips to the shop to restock overpriced garbage bags, and no more running out of industrial trash bags just when you need them the most. Since Plastic Place operates under a 100% satisfaction guarantee, you know that you never have to compromise on quality when you buy our bulk trash bags. If you’d like to talk to one of our experts, we’ll gladly guide you through selecting the very best bag for your needs.